As a child, Teeny loved making pies alongside her mom. After graduating from college, she decided that she wanted to go on a pie making adventure. Teeny wanted to learn specifically how to run a small business as a lady pie baker. I loved how she described this endeavor in an email she sent to to various bakeries about her idea. 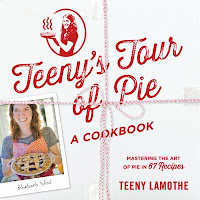 "I'm taking my education into my own hands, and embarking on what I'm fondly referring to as my "Tour of Pie." I'd like to spend a year traveling America, hopping from pie shop to pie shop, spending a month or so at each bakery, and soaking up as much experience and advice as possible. It's an ambitious project, and all the details have yet to be worked out, but it seems to be the most hands-on way to educatue myself in all things pie. Total pie immersion, if you will." Teeny offered to work as a free set of hands at each pie shop, doing anything and everything they wanted in exchange for mentoring and advice. I loved following along with Teeny as she toured America. Her tour included stops in Seattle, WA, Ithaca, NY, Somerville, MA, Chicago, IL, Greensboro, AL, Davie, FL, Atlanta, GA, Los Angeles, CA and ended where all of this began, in her mom's kitchen in Littleton, CO.
Teeny's stories about what she learned were interesting and written in a way that made me feel like I was with her along the way. Most important, this book contains nearly 60 pie recipes, perfect for this (or really any) time of year!